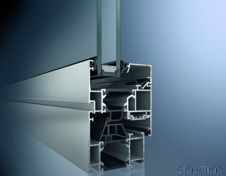 Thermally broken aluminum frames for maximum energy efficiency. Unique three point locking system for different opening options. Includes fully concealed hinges up to 130 kg. Fulfils requirements for fire and accident safety. Available with fully concealed automation. The new generation of TRU windows fulfil the complex requirements of a state-of-the-art sustainable building concept, allowing for optimized ventilation and UV protection. Features such as high thermal insulation, minimal basic depths and narrow face widths are combined. With their wide range of design options, our operable window systems include: Awning, Hopper, Casement, and Tilt & Turn. TRU operable windows clearly increase the prestige and value of a property with a significantly higher level of comfort one intelligently designed product. Our system is the first generation of mechatronic fittings to combine energy management, security, building automation and design. This automation is easy to integrate, whether it is manually operated, time-controlled or sensor-controlled. All motorization takes place in the frame, giving you the same aesthetic as a fixed window. The TRU generation of mechanical concealed fittings sets a new standard in fittings technology. This technology has the same impressive features and technical capabilities as surface-mounted fittings, and come standard on all TRU window systems. All standard window sizes and opening types are possible. The new series of universal handles completes our range of technologically advanced products for all aspects of opening units. The uniform design range is extremely easy to operate and has an impressively clear language of form. With minimal escutcheons our handles are suitable for all mechanical or windows. The combination of design and technology even accommodates the special requirements for fire protection. Includes Schuco AvanTec concealed fitting (no visible hinges) for vent weights up to 130 kg. Clean aesthetic with gearbox built into window styles. Window can be automated for hands-free opening.